A cold, windy atmosphere is a prescription for the creation of frazil. Frazil is a collection of loose, randomly oriented, tiny ice crystals that forms in supercooled turbulent water. The air temperature is usually well below -6 °C, something easily attained in the last few days. Then the lake water can become slightly supercooled, say by about -0.1 °C, and tiny ice crystals form in the water. One might think that this would be a formula for border ice, but winds produce waves which prevent the formation of smooth ice on the surface, so the tiny crystals clump to form rafts of crystals floating on the water and these bump into one another to produce ridges that look like rims around pancakes. 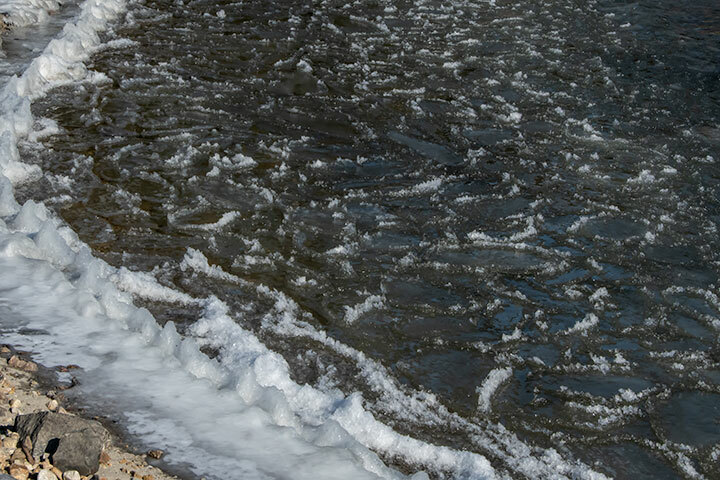 Pancakes of frazil form along the lakeshore as waves prevent the formation of border ice. Very interesting! always something new to learn from your blog. thanks. Peter, the ice rings on the water have a diameter of about 40 cm, which is also about the width of the berm of ice along the shore. describe what is around us are a delight to me. Thank you, Alistair.